The Riding School is a field enclosure for horse training, fronted by a long redbrick wall that faces the Gatehouse courtyard to the west. It is arcaded with ten arches which equally flank a central doorway beneath an eleventh archway that leads to the enclosed riding area beyond. At either end of this arcaded wall is a pair of rusticated redbrick gate pillars. To the north, the gateway is attached to the ‘Cider House’. To the south it connects to the farm building called ‘Old Farmhouse’. 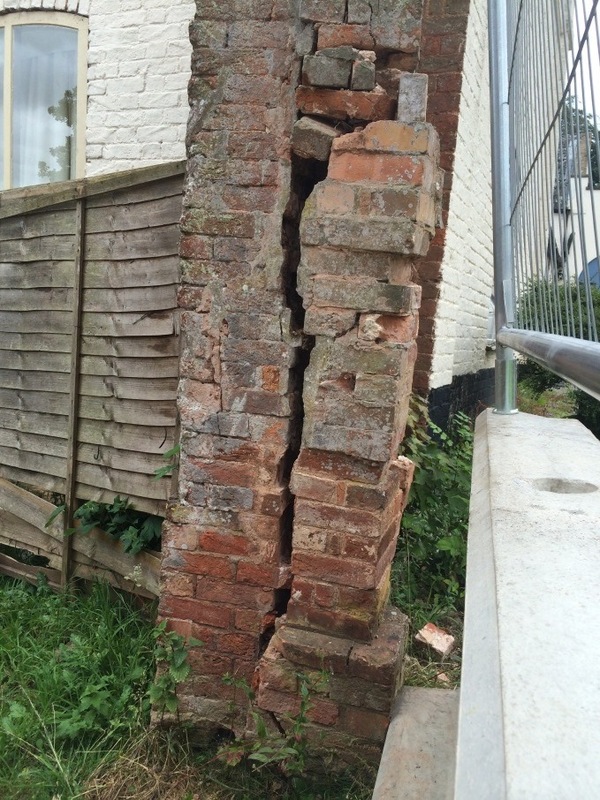 Directly behind the wall, though not exactly centred, is the much older ‘Dovecote’. This dates from at least the seventeenth century, though the reason for its unusually vast size is the subject of some debate, as well as a future blog entry. The Riding School wall appears first on the 1771 estate map. To the rear of its decorated wall stand simple lean-to structures, which were at least partly built as stables, and were fitted out as such until the twentieth century. The irregular and undecorated façade of this east side, with its simple openings and humble appearance, is very different to the classical grandeur of the west arcaded façade. 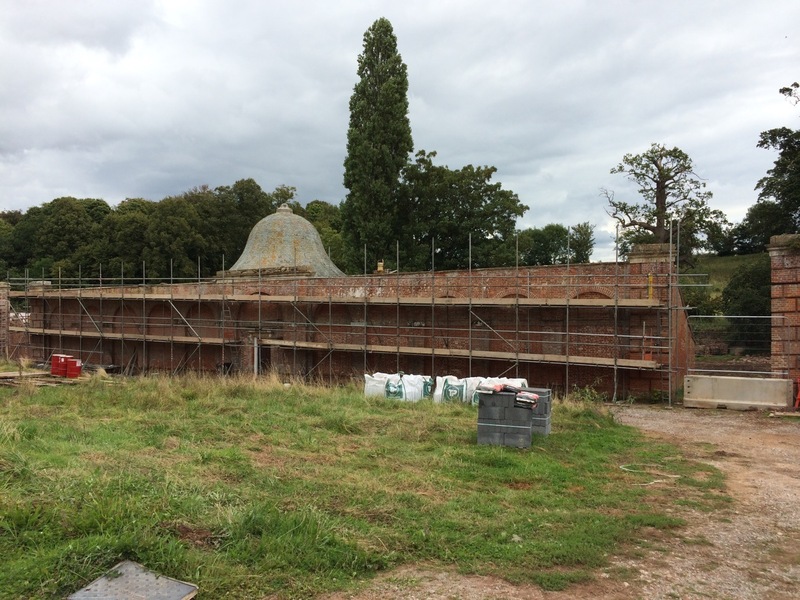 During 2015 the entire Riding School west wall was re-pointed and the brickwork restored. This included new stone masonry all along the parapet and to the stone door surround, executed by the celebrated Somerset stone mason Tom Waugh. 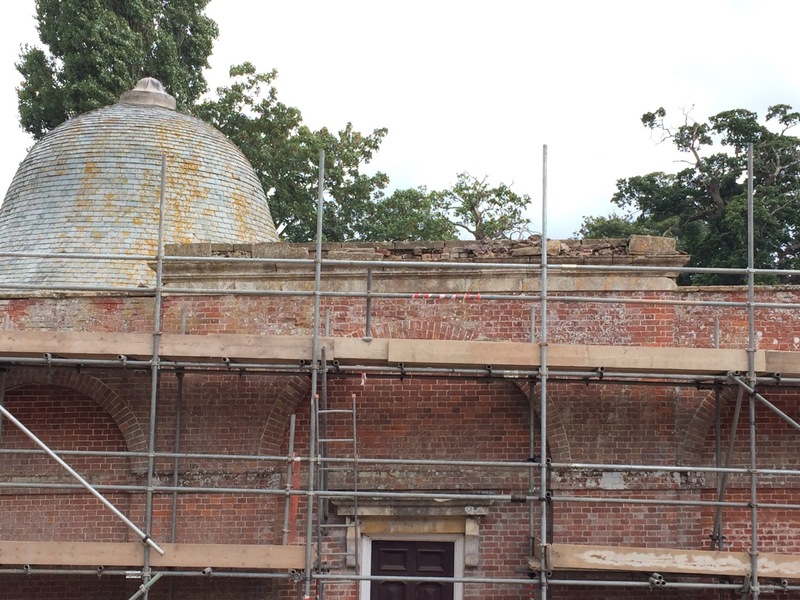 The central stone entablature, shattered by weather and vegetation until all the stonework was fully restored. By at least 1908, when this photo was taken, the Riding School had ceased to function and had been turned over to become part of the gardens. 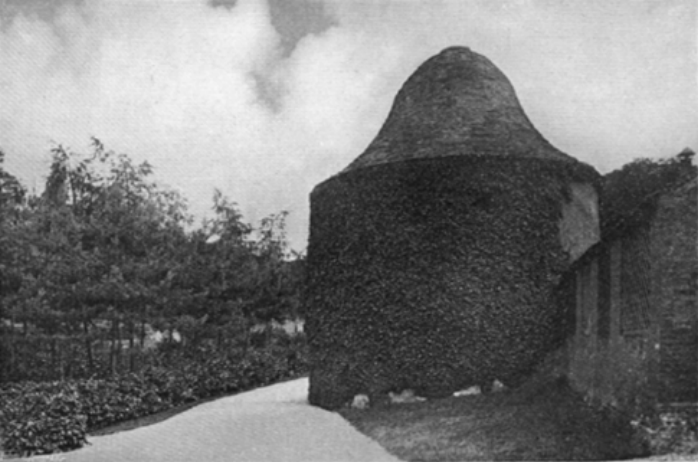 The seventeenth-century dovecote is that garden’s most prominent feature, the eighteenth-century lean-to stable buildings are to the far right. The northern gate pillar (above) is attached to what was the electricity sub-station from c.1950-2015 and had such a precipitous lean that it had to be kept upright by scaffolding to prevent it from collapsing completely. 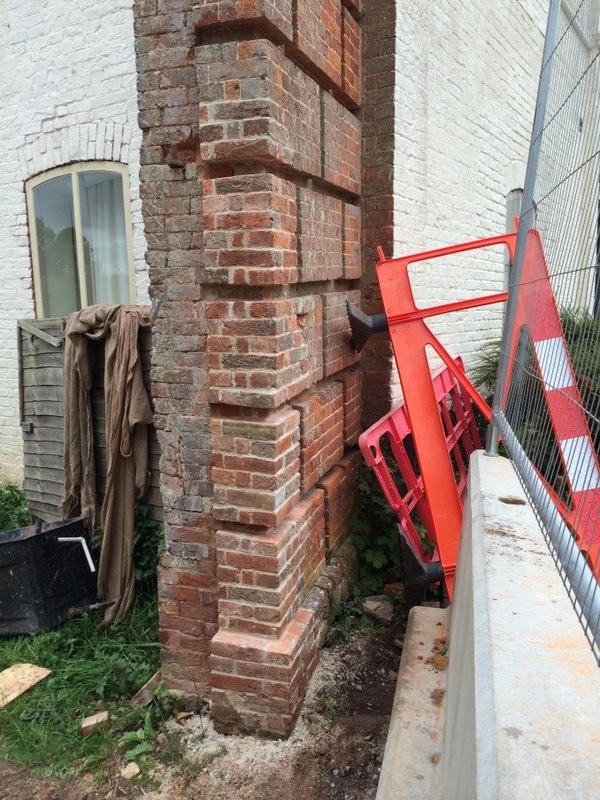 In 2015 we took this pillar down brick-by-brick to its foundations, so that essential repairs to re-straighten its angle could be undertaken. The pillar was then painstakingly re-built and re-capped with its original stone entablature. 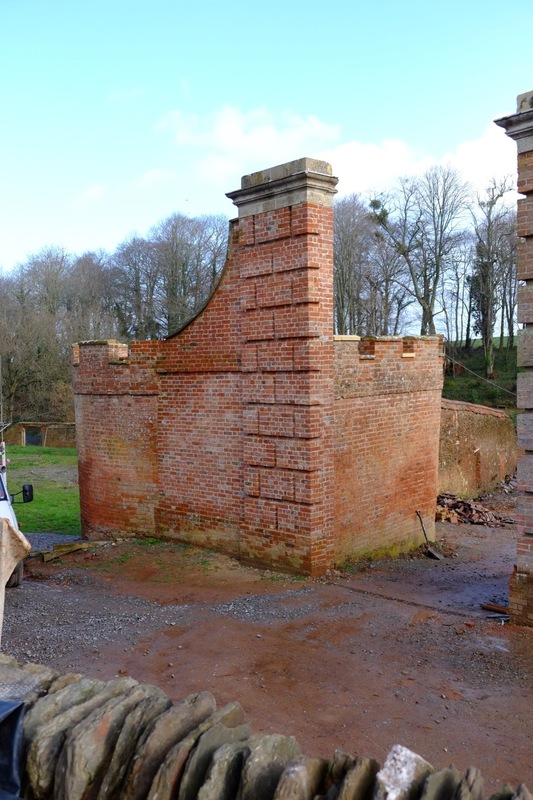 The work carried out on this pillar included the complete restoration of the ‘Cider House’ – but that is for another update! You are doing wonderful work, restoring different parts of the estate. It is an interesting journey and I very much appreciate you sharing the history as well as the progress of the new developments with those of us who are interested. Thank you.